Please open your mind for a simple thing. I have many potential stories for tonight, but my mind is a jumble; I spent the evening in Columbus having my hair cut and dining with a friend who lives in a truly lovely part of the city. On the way home, I skirted the airport from just the right direction to see one runway/taxiway's whole set of lights (the blue ones are my favorites), but I also drove through intermittently heavy rain over already slickdarkened streets, nothing on the ground being illuminated by the lightning whipping its rooty tentacles across the sky over and over, and over. My original title for this post: What is this charge in the air? Everything feels the slightest bit electric; everything has shifted three paces to the left and turned counter-clockwise 45 degrees, possibly in part because the playlist I'd whimsically picked out for the drive is a bizarre collection of sassy and off-kilter love songs, including Nouvelle Vague's deeply weird "This is Not a Love Song." The whole trip back, the roads steamed, cooling as the rain passed southward, back the way I had just come. The roads steamed the way the swimming pool used to steam on cool mornings, the way it steamed the night my team came home late from another loss (we always lost; we had no indoor pool) when I was very young and fast and spent bus trips belting out Chicago's "You're the Inspiration" with all the other girls, only I knew all the words and the harmonies too. Traveling over rural roads late at night, one encounters barns and buildings--but especially barns--as sudden geometries, the shapes of solidity itself, swiftly there, then swiftly not-there, velocity's darkness swallowing them wholly. The day we drove to western Iowa, we drove home for hours with lightning raging through the darkness all around; the winds were so high that we feared tornadoes, in the dark. Instead there was just rain, and more rain, buckets full, drops as big as shots tossed back, bottoms up. 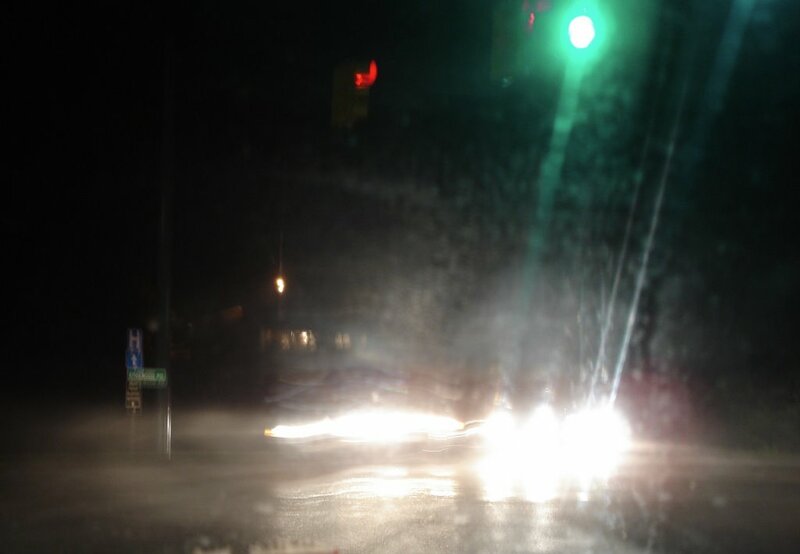 My night vision is terrible, just terrible, but my wakefulness behind the wheel is formidable, and so I ended up driving us most of the way through that slapping rain, heavy punisher. The other story I want to tell you is about wooden spoons. But that's the one that will wait, now that I'm tired. I will perhaps have to go back to writing during the afternoons or even the mornings; I seem to get awfully tired at night these days. So, please open your mind for a simple thing: I suspect you'll hear about wooden spoons tomorrow, if you're around.